Welcome to the Glen Ellyn Park District Gymnastics program. 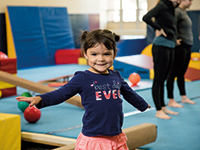 Classes, located in the Gymnastics Center at the Spring Avenue Recreation Center, are a fun way for boys and girls to learn basic gymnastic skills under the supervision of trained professionals. 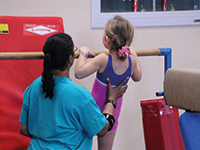 Gymnastics improves strength, balance, and flexibility while helping children build self-confidence and new skills. From Parent/Tot to our competitive tumbling team, our coaches and staff strive to give each student superior instruction in a fun and enjoyable manner. 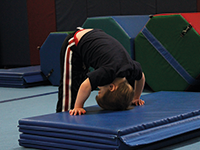 This fun-filled parent/tot play time program introduces your child to the exciting world of tumbling and gymnastics. 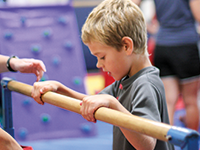 Parent/Tot features tumbling and gymnastics equipment, balls, hoops, circles & parachute play. Parent involvement is the key to this class. Please no siblings. 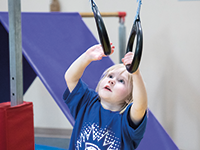 This introductory gymnastic class helps develop gross motor skills and body awareness and teaches self-confidence while having fun. 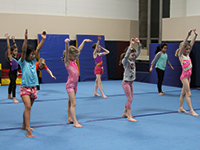 A variety of gymnastic and tumbling stations will be set up each week to introduce your gymnasts to the basic skills used in this sport. Children must be able to attend without a parent present. 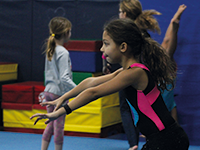 A variety of gymnastics and tumbling stations will be set up each week to introduce your gymnast to the basic skills used in this sport. Children must be able to attend class without a parent present. This class was designed to help refine and develop the gross motor skills taught in previous classes. A higher skill level of gymnastics stations will be set up each week to increase strength, flexibility and coordination. The focus of this program will be on floor exercise, springboard skills, bars and beam. Stretching and conditioning for muscle tone will be included. This is a beginner program. Your child will focus on Olympic events including beam, floor exercise, vault and bars. Class will also include stretching, apparatus skills, and conditioning in a safe and controlled atmosphere. Participants must be able to perform cartwheels, round-offs, forward/backward rolls, and a bridge. Tumbling 1: No skills required. Start out learning the proper way to perform handstands, cartwheels, & more. Participants will build on their skills each session. Tumbling 2: Participants should possess basic skills, such as; cartwheel, round-off, forward/backward rolls, handstand, & bridge. 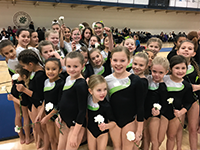 The Glen Ellyn Grasshoppers Tumbling Team focuses solely on tumbling and will compete in meets through the Illinois Park District Gymnastics Conference. Click here to learn more about the program.